Full length aluminium ferrules and crimps for forming eyes and stops on galvanised steel wire rope. Aluminium ferrules & crimps manufactured to conform to EN13411-3. Also known as wire rope sleeves, cable crimps and turn back ferrules. NB: Aluminium ferrules should not be used in marine or coastal environments with stainless steel. 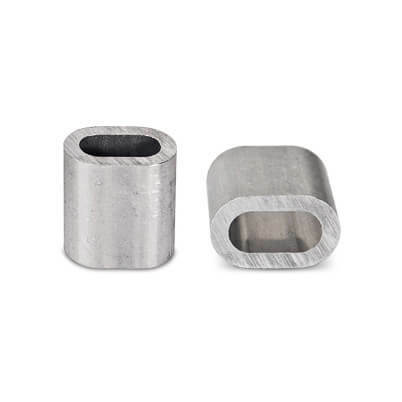 Aluminium ferrules available to fit 1.5mm, 2mm, 3mm, 4mm, 5mm, 6mm, 8mm and 10mm wire rope. Sizing is like for like. E.g. 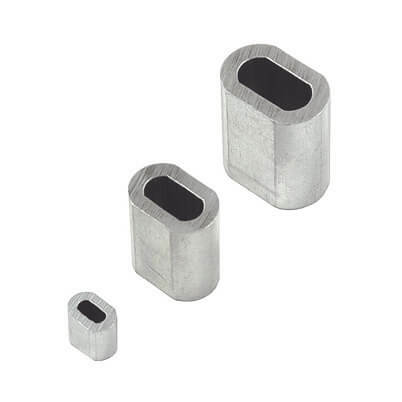 Choose a 4mm Aluminium Ferrule to suit 4mm wire rope. 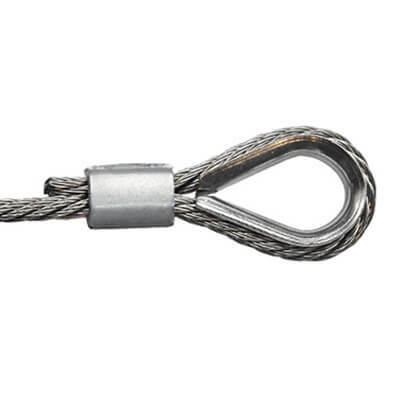 Simple soft loops can be added to wire rope by placing the aluminium ferrule over the end of the wire and looping the wire back on itself, passing back through the aluminium ferrule. Once in place use a swaging or crimping tool to compress the aluminium ferrule until it holds the wire firmly. Creating a hard eye loop using a nylon thimble with an aluminium ferrule. 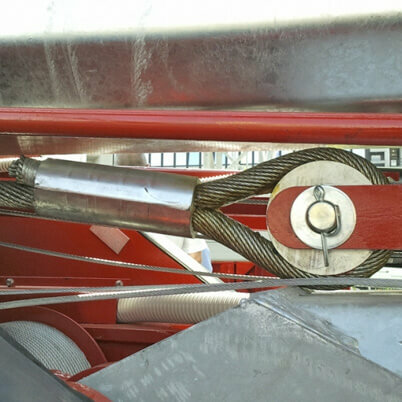 Simply lace the dead end of your wire rope through your aluminium ferrule and loop the end of your wire rope around the outer groove of the thimble. Pass the end back through the aluminium ferrule and pull-in the dead end to fit tight around the thimble. Once in place, we recommend using a crimping tool to compress the aluminium ferrule firmly onto the rope to hold your thimble loop securely. Does what it says on the tin. Simple to use. Good finish to the job. Easy to use. Have used before and no fails so far. Easy to use web site and fast delivery. Excellent! They do the job. You will need to cut the wire rope nice and cleanly to get the ends into these, but they grip well when crimped. Very high quality product and a good price. Provide a good solid fix and can be crimped with Mole grips if you don't have the correct kit. Use two each time for additional security. Nylon Thimble Eyes to create the perfect reinforced eye loop.